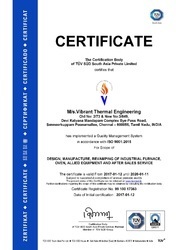 Established in the year 2007, we, "Vibrant Thermal Engineering", are one of the leading Manufacturer, Trader, Importer, Service Provider and Exporter of Industrial Furnaces & Ovens. Our range consists of Industrial Furnace, Bogie Hearth Furnace, Industrial Oven, Pit Type Furnace, Quenching Furnace, Bell Furnace, Forging Furnace, Rotary Furnace, Shell Baking Furnace, Hardening and Tempering Furnace, Heat Treatment Furnace, Continuous Furnace, Non Ferrous Melting Furnace, Laboratory Furnace, Industrial Oven and Dryer, Hot Air Generator, Furnace Spare, Aluminium Heat Treatment. 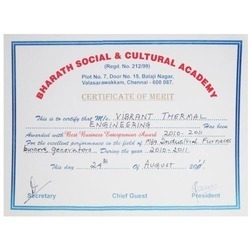 The Vibrant Thermal Engineering is a new generation of thermal application engineering. 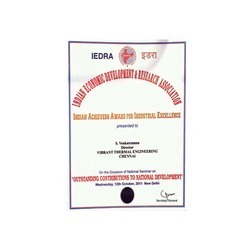 The company is promoted by young and dynamic technicians with more than 10 years experience in furnace manufacturing and servicing company and 3 years experience running own company as managing director on partnership deed. VIBRANT offers total solution for thermal application and for turnkey projects of industrial automation. We offer total highly advanced fuel efficient burner, ceramic fibre insulation, refractory lining, instrumentation, automation of furnace, kilns and combustion system for your energy efficient production. Under the able and efficient guidance of our mentor 'Mr. 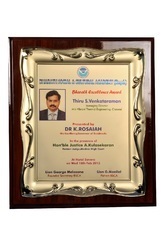 S. Venkatraman', who has years of experience in this field, we have been able to gain a strong foothold in this competitive market. His ethical business dealings and strategies assist us to meet the requirements of our clients in better way. We are Looking for inquiries from U.A.E, Dubai, Saudi Arabia, Kuwait, Vietnam, Singapore, Malaysia and Sri Lanka. We are engaged in manufacturing a wide range of industrial furnace. In order to provide premium quality we always use graded raw material. Our assortment includes Industrial Furnace, Bogie Hearth Furnace, Industrial Oven, Pit Type Furnace, Quenching Furnace, Bell Furnace, Forging Furnace, Rotary Furnace, Shell Baking Furnace, Hardening and Tempering Furnace, Heat Treatment Furnace, Continuous Furnace, Non Ferrous Melting Furnace, Laboratory Furnace, Industrial Oven and Dryer, Hot Air Generator, Furnace Spare, Aluminium Heat Treatment. Our products are highly acclaimed for the features like accurate designs, durability, low maintenance, cost effectiveness and reliability. Moreover we also offer total highly advanced fuel efficient burner, ceramic fiber insulation, refractory lining, instrumentation, automation of furnace, kilns and combustion system for your energy efficient production. 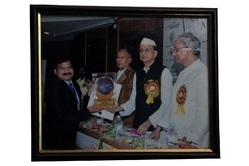 We also provide customized products as per the varied needs of our esteemed patrons. 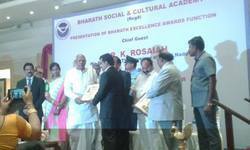 Bharat Excellence Award from BHARAT SOCIAL & CULTURAL ACADEMY On 18th Feb, 2015 from Groverner of Tamilnadu, India. We are experts in providing turnkey services. We cater to the needs of our clients. We provide overall solution in our respective domain to facilitate industrialized mechanization and turnkey projects. Our highly qualified professionals facilitate us to take turnkey projects and make a check on the total method. Our designing enables our labor with the installations. Our entire client chain is satisfied with the turnkey services and we are capable to maintain a strong grip in the market. We pitch forth one of the superior quality products which have undergone quality tests under the eyes of our experts. We manufacture excellent quality products within the stipulated time frame at cost effective prices. We have the ability to customize our clientele through which we are able to edifice a strong grip in the market. We are also offering customized solution for our clients and offer oil and gas fired furnaces which have a temperature range of 1200 °C. Our products are widely used in various industrial application and research fields and are fitted with superior programmable chip for atmospheric regulation for oxidizing / reduction atmospheric. Our product have easy interface and have tolerance level of 5 °C which enables for precise profile management. 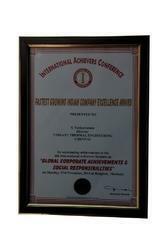 Received for Global Corporate Achivements & Social Responsibillties on 17th Nov, 2014 in Bankok. Moreover we also provide customization facility to our patrons and owing to these features we have been considered as one of the renowned names in the respective domain. We as a renowned manufacturer supply our products to various industrial sectors. The proper and accurate dimensions of these products have carved out a niche for us in the market. Our team comprises of extremely trained and highly skilled professionals to cater the needs of their clients. Our team members undergo stringent training so that they could understand the diversified needs of our clients. They are devoted and committed in their respective domain. 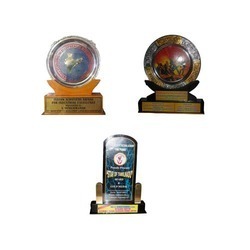 Their whole hearted devotions have industrialized our manufacturing procedure. 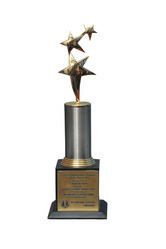 Our continuous dedication and hard efforts is the main factor to gain brilliance in our field. We have been serving the industry for the past many years. Since our inception period we have generated a good repute among our clientele. We supply ample variety of products within the stipulated time frame. The peerless quality products offered by us attract our clients the most. Owing to our superior quality products and ethical business practices we have been able to achieve a commendable position in the competitive industry.